The storage tank water heater is the most popular water heater installed in homes today. They can be located inside the home in a closet or utility room, in a garage or outside the home in a outside closet or storage shed. Traditional tank water heaters are even found in the attic in some areas. Depending on where in the home the water heater is located each installation can be different and have different requirements. Installation requirements can also vary from city to city depending on what part of the plumbing code they have adopted and are enforcing. There are two main types of traditional standard storage type tank water heaters: gas and electric. 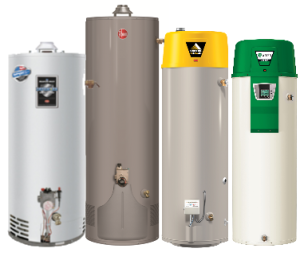 Each manufacturer makes a variety of models for each type of water heater and LP or propane gas models are available, but are not as common as natural gas. Depending on what your installation situation is will determine what unit is right for you. Below are a few ideas to keep in mind when shopping around and what we feel are the most important things to keep in mind when purchasing a new unit. 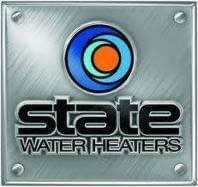 Please call 951-688-1175 to contact us with any questions or for help in selecting the right water heater for you. We are available 24 hours a day 7 days a week. Gas storage tank water heaters come in a variety of sizes including, 30, 40, 50, 60, 75 and 100 gallon residential models. How many bathrooms you have in the home and how much hot water you want available will determine the size of the unit you purchase. For example, a 3 bedroom 2 bathroom home typically has a 40 gallon water. If you are replacing your water heater and you want to increase the amount of hot water you have you can easily upgrade to a 50 gallon water heater, but increasing to a tank larger than 50 gallons can also result in additional vent work and extra costs that may not be worth the increase in hot water. Each home and family are different so think about what will best work for you and your family before making a final choice. The design of a gas water heater is fairly simple. Gas is burned in a combustion chamber at the bottom of the tank to heat the water inside the unit. Each water heater has an flue vent that runs inside the middle of the tank to release the carbon monoxide made when the gas is burned. You can control the temperature of the water with the gas control valve which is located on the bottom front area of the water heater. Most gas water heaters have an energy rating between .54 and .62 depending on the internal insulation and gallon capacity. Gas water heaters with a .62 rating are considered energy efficient and will save a small amount on annual operating costs, but the cost of the unit is only slightly more. These tanks usually have more insulation and are wider though they may not fit in all installation applications; however, it’s worth it to ask if they are available and will fit in your home. Propane storage tank water heaters work almost identical to gas water heaters. They have the same models available and operate in generally the same manner. The main difference in these units is in the gas parts, controls, burner chamber and pilot tubing. Liquid Propane, also known as LP gas or propane gas burns differently than natural gas. It is extremely important install a propane type water heater if you have propane gas. Most often if you currently have a propane water heater, it will say LP on the rating plate and you will have propane service. If you are not sure, ask the professional when you call and they should be able to tell by the model or part number on the water heater. Energy efficiencies and warranties are just about the same for both propane and natural gas water heaters. Many products boast longer warranties or extended warranty options, but the most important part of your warranty is who will actually service your unit if you have a problem. Most water heaters are designed to last approximately 10-12 years, however during the life of the unit parts can fail or issues can arise. The manufacturer will always honor the warranty, but they do not provide onsite service. It’s important to know who to call that will diagnose and repair the water heater in the event there is an issue. Not all companies service the brands they install, prior to hiring a company to install your unit always make sure they back the warranty and will provide service if there is a problem within the warranty period. Water Heaters Only, Inc always backs the warranty on the products we install. The FHR or first hour rating on a water heater tells you how much hot water the tank will produce in the first hour of usage (the hot water in the tank + how much new hot water the tank will make while it’s being used). A higher FHR means you will be able to use more hot water within a shorter period of time. Units with a higher FHR have more BTU input and offer a better recovery rate. The recovery is how much hot water will be recovered after you have used all the hot water in the tank. Units with a higher recovery will reheat quicker so you don’t have to wait for hot water between showers or baths. If you have the room and need more hot water because you run out of hot water frequently it might be a good idea to see if you can increase the gallon capacity and the BTU’s of the new water heater your purchase. Call 951-688-1175 to speak with a water heater expert or to schedule an appointment. 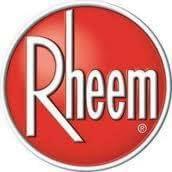 We look forward to helping you solve your water heater needs at an affordable price.